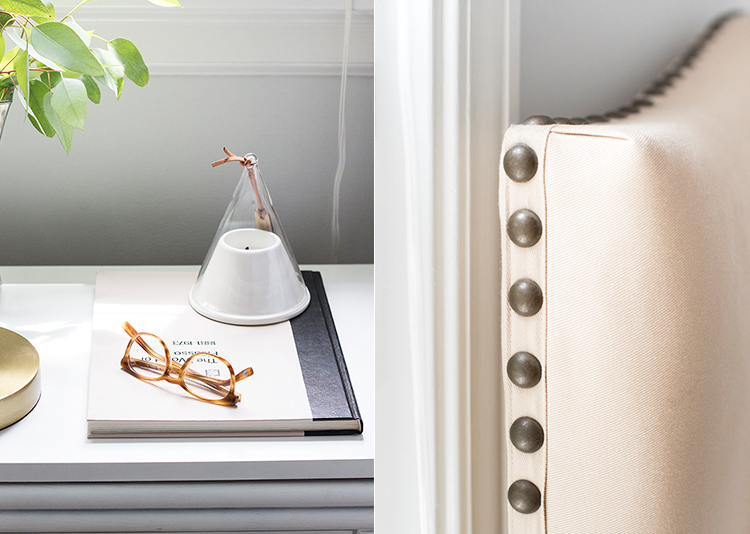 Today I’m happy to announce that I’m showcasing the savvy, the chic…Jacqueline Brown (Blog: Room For Tuesday)! How do I know Jacqueline? Jackie and I went to college together — Go Miami! Fun fact: Our senior year, we spent spring break together (with three other great friends) cruising over the ocean from Mobile, Alabama to Cancun, Mexico! Jackie is thoughtful, sincere and uber stylish. I will always remember her wedding as it was one of the most beautiful parties I have ever attended. Jackie kindly answered many of my blogging questions when I was first launching my site a few months ago and I couldn’t be more thankful for her guidance. Thanks, Jackie! 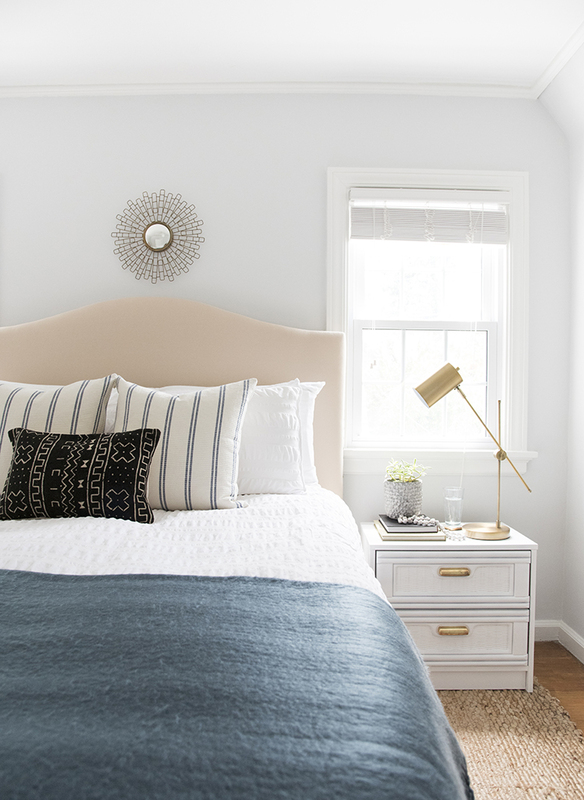 Take a look at one of her favorite recent posts entitled, “A Serene Master Bedroom“. 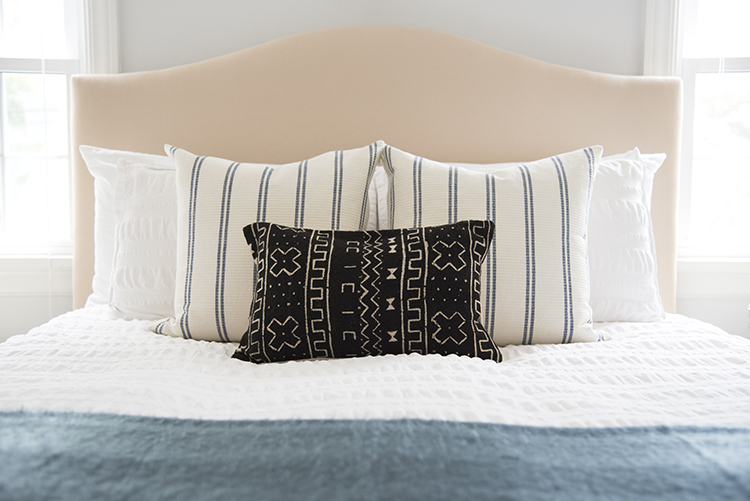 “I’m excited to finally share the full reveal of my serene master bedroom. This room has been a work in progress for the past year. When designing this space, I wanted to create a room that felt calm and cool with lots of natural light, neutral colors, and deep hues of blue. Blue is a color I tend to gravitate towards in decor because it always leaves me feeling happy. 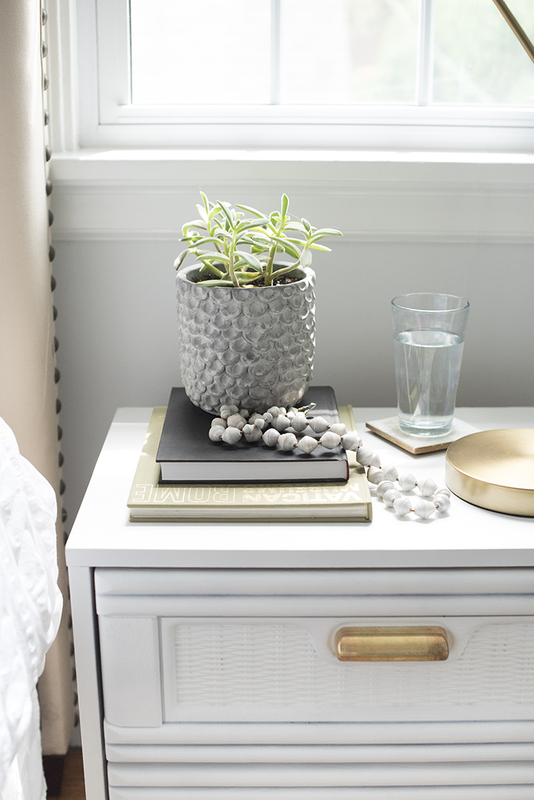 I recently updated my nightstands … did you see the before images?! Sarah found the faux bamboo pair for me at the thrift store and I gave them a total facelift. 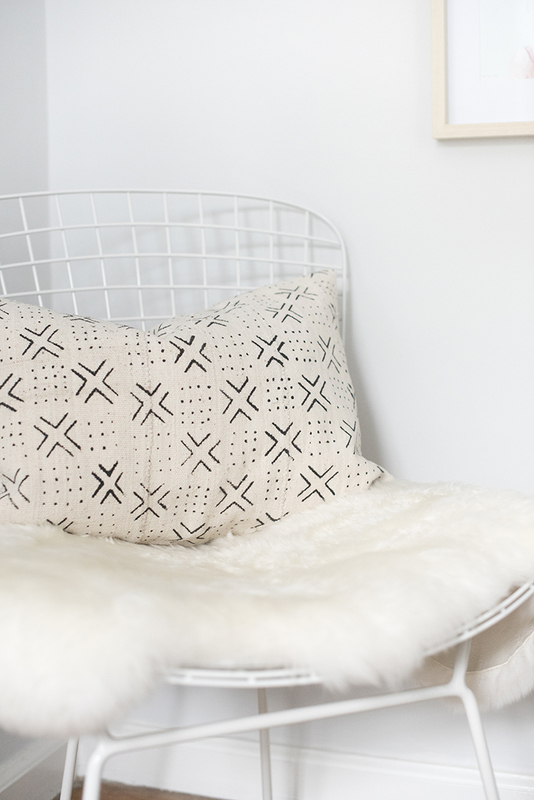 Making a small change to a room can have such a huge impact. Not to mention, they add so much character to the bedroom. By using a piece of furniture with built-in storage, function was added to an already tight space. This room also presented challenges in regards to size. As you can probably tell from the photos, this room is small – like a box! So, I wanted to be very minimal with furniture and decor, in an effort to avoid clutter. Believe it or not, when walking through this house for the first time, there was a four-post bed and an oversized dresser crammed into this space. Opening up the room (without physically moving walls) took a little creativity. Having a tiny house means taking advantages of every single space. I recently transformed the bedroom next to the master into my dressing room. This gives me a place to get ready, store clothing, and provides seating… since the master is SO small. Question for you: Who is your favorite blogger to follow?